Duplex Business Cards are created by mounting two stocks of your choice together, to create a custom double thickness card. You can choose one of our popular combinations or let your creativity flow to make a truly unique business card! As well as being thick and durable, Duplex Business Cards have many other benefits. You can add embossing, without the opposite impression interfering with the design on the back of your card. If your design would best suit a textured or colored stock on one side, and a smooth or white stock on the other, you have the flexibility to make this a reality with Duplex Business Cards. Produced on 40pt with 18pt die cut backing. White letterpress ink on back side. What are your paper options for duplex (2-ply) business cards? Most of our offerings can be found from our Duplex Business Cards page. If there is a combination not available from our standard options, you may request a Custom Print Quote and a member of our Print Estimations team will provide you with a quote. Duplex Business Cards (previously named 2-ply) involve two stocks pressed together. This can be produced with two of the same stocks to double the thickness, or it can be done with two different stocks to allow for a different appearance on each side of the card, and add a layered look to the edge. How thick is a 2-ply business card? Any combination will be very sturdy and extra thick. As an example, our 2-ply W1S Brown Kraft and White Recycled Business Cards have a final thickness of 34pt - much thicker than a normal card. Our 2-ply business cards can be created in any combination of stocks, so the final thickness will vary depending on your selections. What add-ons are available with 2-ply business cards? Other add-ons that can be requested with a 2-ply order (depending on stocks used) include die-cut shapes, foil stamping, screen printing and embossing. Please place a Print Quote request for these services. Since 2-ply products are created with two stocks, they tend to be very thick in the final product. This is perfect for adding coloured edging, however please keep in mind that some coatings are not compatible with edge colour. If you want to order 2-ply cards with coloured edging, please submit a Print Quote request and our Estimators can let you know if your desired stocks will work with this add-on. Can I receive samples of 2-ply Business Cards?
. A 32pt Brown Kraft card sample is an example of using two of the same stocks to double the thickness. A 34pt W1S card sample is a great example of combining two different stocks as it uses 100% Recycled Brown Kraft on one side and 17pt Smooth Uncoated White on the other. If you would like to receive samples of other unique 2-ply combinations such as W1S Wood or Premium Black, you can order them in a Specialty Sample Pack. We include two examples of a 2-ply business card in our Recycled Sample Pack. 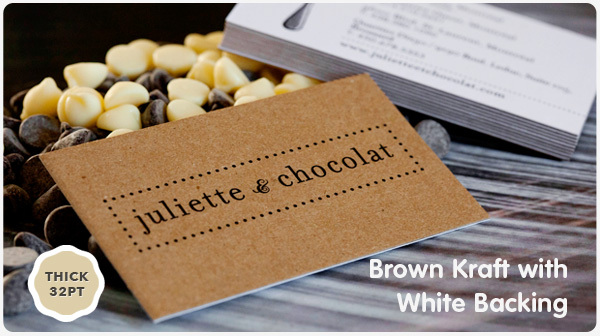 A 32pt Brown Kraft card sample is an example of using two of the same stocks to double the thickness. A 34pt W1S card sample is a great example of combining two different stocks as it uses 100% Recycled Brown Kraft on one side and 17pt Smooth Uncoated White on the other. What is a 2-ply Business Card? A 2-ply Business Card is a card created by mounting together two stocks. This can double the thickness of a thinner stock by adding an extra layer, or can be used to combine two different stocks for a unique look. W1S simply means "White One-Side". W1S cards are a 2-ply card – with the back ply/layer being White. 3-ply is another way of referring to our Layered business cards. These are different from 2-ply cards in that they use three stocks pressed together. Usually the middle layer is made from colourful paper stock to create a unique layered edge look. Can a 2-ply Business Card have a custom shape? If you wish to have a cut-out shape in one half of a 2-ply product leaving the back side solid, this can be produced with laser cutting. To request a quote for a layered products with a custom shape or laser cut-out, please submit a Print Quote request. We can die-cut Layered products (such as 2-ply and W1S cards) to create hang tags, shaped business cards, or your own custom shape. When creating your design, any important content (text and graphics) should be placed away from the edge (or trim line) to avoid being trimmed due to the unavoidable shifts that may occur during the production process. We recommend a safety margin of 0.25 inches away from the trim line for this product - that is 0.375" from the bleed. This is a larger safety margin than most standard 1-ply cards, and helps account for the larger shift known to this product. If your files do not meet this guideline you will be sent a warning for “text close to edges,” or in some cases you may receive a File Error. Download the business card template for the larger safety marginhere. We take all necessary precautions to avoid as much shifting as possible, however this risk is higher with duplex and triplex cards because of the additional mounting process - shifts of of 0.0625" to 0.125" can occur. The further your artwork is away from the trim edge of the card, the less noticeable any shift will be. If you are concerned about possible shifts, we recommend changing to a single layered card to reduce this risk. We are not able to produce a double border (border on both front and back) with this type of product. This is because registration is more difficult, and the border on one side would very likely end up off-center. If you require a border on one side, we recommend to keep this a minimum 0.25” inwards from the trim line. If the border on both sides is integral to your design, we highly recommend to change your order to a 1-ply product with Offset output, such as the 28pt Mega Thick cards. To avoid this, you can modify your design so one side does not have full bleed or you can choose to print your design on a coated stock with Silk Matte coating instead. Offset print on uncoated stock is less likely to show obvious chipping even with full bleed on both sides; however, there is always a chance of some fraying on uncoated stocks. This is variable between the stocks that are being mounted together, but we do recommend having full bleed on only one side of your card to avoid this. Often a 2-ply card is ordered to hide the opposite effect of an emboss or deboss inside the two stocks, so the back is left unaffected for printing or so the back can also be debossed / embossed. We do not recommend this for uncoated stocks, as the mounting of the cards can damage the emboss / deboss on these softer stocks. Coated stocks are a much better choice for this type of product; however, there are other design considerations that apply to each of these projects that are specific to the design. It is best to consult with one of our print specialists if you are interested in this product by requesting a Print Quote.